Chain O' Lakes & Crystal River frontage on a total of 76.28 Acres offers the best of both worlds to enjoy as your private retreat or a premium development. 1st time offered this unique property offers the ultimate recreational compound with 325 ft of sand beach on Long Lake PLUS 700 feet of sand frontage on Long Lake & both sides of over 2800 feet of Crystal River frontage connecting the two parcels via foot bridge. This picturesque country setting provides a highly desired lake and river front retreat. There is a home with an established weekly rental offering 3 bedrooms 1.5 baths, barn, large garage and outbuilding located at E946 Rural Road, Waupaca. Groomed trails throughout the property will amaze you at every turn over the rolling hills & woods. Make this your private retreat or divide into parcels and share with your friends. Property is zoned Rural Residential & can be split into 1 acre parcels under current zoning. Ideally ready for your development ideas to blossom or keep it all to yourself and enjoy all 4 seasons on this hidden treasure. Excellent hunting, fishing, cross country skiing or just walking the many groomed trails will reconnect you with nature. Recreational Opportunity Awaits! 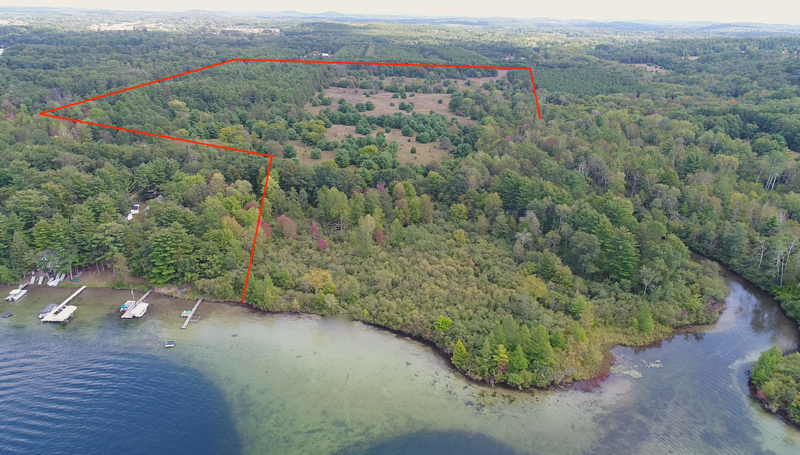 76 Acres on Lake & River!